The Professional Coin Grading Service (PCGS) has established the PCGS CoinFacts™ Coin Dealer Hall of Fame and named six acclaimed dealers as its inaugural inductees: Q. David Bowers, the brothers Henry and Samuel Hudson (S.H.) Chapman, B. Max Mehl, Wayte Raymond and W. Elliot Woodward. Hall of Fame honoree Q. David Bowers (left) is congratulated by Collectors Universe President and PCGS Co-Founder David Hall (right) at the PCGS Set Registry luncheon in Boston, August 13, 2010. "The PCGS Set RegistrySM Hall of Fame recognizes outstanding collectors and their collections. The PCGS CoinFacts Coin Dealer Hall of Fame was created to recognize outstanding dealers, past and present, who have handled the greatest coins and collections, and who have made the most significant contributions to numismatics," said David Hall, PCGS Co-Founder and President of Collectors Universe, Inc. (NASDAQ: CLCT). The announcement about the Hall of Fame and the initial inductees was made at the PCGS Set Registry luncheon held in conjunction with the American Numismatic Association World’s Fair of Money in Boston on August 13, 2010. "This is just the beginning. Each year, additional dealers will be inducted into the PCGS CoinFacts Coin Dealer Hall of Fame, and the announcements will be made at the annual luncheons," explained Don Willis, PCGS President. "An archive of information about the Hall of Fame honorees will be posted on the PCGS CoinFacts and PCGS Set Registry websites." The nominating committee is composed of Bowers, John Dannreuther, PCGS CoinFacts President Ron Guth and Hall; however, Bowers did not know his name was secretly being considered by the other nominees. Here is a summary of information about each of the 2010 inductees. (Quentin) David Bowers, Chairman of Stack’s in New York and New Hampshire, is a prolific author of over 50 books and monographs, and is the only person to ever serve as President of both the Professional Numismatists Guild (1977 – 1979) and the American Numismatic Association (1983 – 1985). He is a Trustee of the New Hampshire Historical Society, Fellow of the American Antiquarian Society, Massachusetts Historical Society and American Numismatic Society and an annual lecturer at Harvard University. Bowers began buying and selling coins at the age of 14 while still in high school. He has cataloged and sold at public auction some of the most important numismatic collections ever assembled including the collections of Louis E. Eliasberg Sr., Harry W. Bass Jr., Ambassador and Mrs. R. Henry Norweb and the John Work Garrett Collection sold by order of The Johns Hopkins University. In addition to his own writings, Bowers now is helping to expand numismatic knowledge in his role as Numismatic Director of Whitman Publishing, LLC. Numismatic Literary Guild Executive Director Ed Reiter has described him as "A one-man library." Bowers is one of the most revered and honored numismatists in the world. Samuel Hudson (S.H.) Hudson and Henry Hudson were both young men (21 and 19, respectively), when the brothers formed their numismatic partnership in 1878. Their first auction catalog, issued in 1879, set a new standard for the industry with the introduction of phototype plates; all of their sales are characterized by a level of scholarship and quality that had not been seen before. This helped the brothers land the coup of their career, the sale at auction in 1882 of the collection of Charles I. Bushnell. Today, all of the auction catalogs produced by the Chapman brothers are highly prized, especially the small version formats with plates. In 1906, the bothers each formed his own firm, but continued the same level of professionalism and scholarship that characterized their joint partnership. Much of the style of cataloguing and presentation seen in today’s auction catalogs was influenced by the works of the Chapman brothers. B. Max Mehl started his career as a part-time dealer circa 1900 while still a clerk in a shoe store, but went on to become one of the most prolific coin dealers of his time. His secrets: hard work, intense advertising campaigns, tireless self-promotion, and innovative marketing. He was the first to advertise in non-numismatic media. He published a small booklet and sold over a million of them for a dollar apiece. By the 1930s, when America was suffering through the great Depression, Mehl was spending upwards of a hundred thousand dollars a year in advertising. In a record day, he reportedly received 72,000 pieces of correspondence. He offered a reward for any example of the 1913 Liberty Head Nickel, causing people from all walks of life to examine their pocket change for elusive treasure. He handled incredible collections built by the likes of H.O. Granberg, Waldo Newcomer, William Forrester Dunham, William C. Atwater and many others. And he did this all from Fort Worth, Texas, far from the numismatic scenes in New York, Philadelphia, and California. One can only imagine the many ways that B. Max Mehl, called the "P.T. Barnum of numismatics" by fellow dealer Abe Kosoff, would have used today’s technology to popularize the hobby. Wayte Raymond was a prolific dealer and publisher whose legacy includes his still-useful National Coin Albums (first made in 1928) for which he secured the franchise and promoted them extensively in the 1930s, and the ground-breaking research he sponsored and promoted. From 1912 to 1918, Raymond was involved with Elmer Sears in the United States Coin Company; later, he was associated with James G. Macallister in J.C. Morgenthau & Co.; still later with the Scott Stamp and Coin Co. In 1952, Raymond hired a young man named Walter Breen to conduct research in the National Archives, a fresh approach that resulted in numerous publications and a rapid advancement in numismatic knowledge. Much of the data uncovered by Breen was incorporated into later editions of Raymond’s The Standard Catalogue of United States Coins, a reference book introduced in 1934 that was the first comprehensive price guide with mintage figures of U.S. coins. Additional publications he launched over the years included the Coin and Medal Bulletin, the Coin Collectors Journal and Coin Topics. 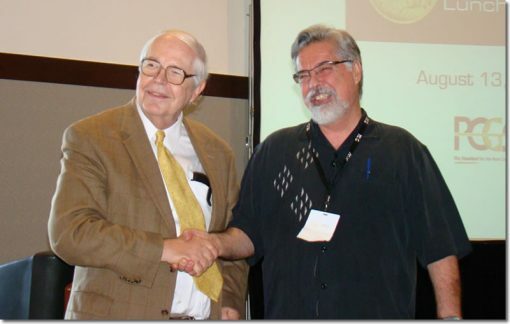 In honor of Raymond and his contributions to numismatic research, the American Numismatic Association instituted the Wayte and Olga Raymond Memorial Award for Distinguished Numismatic Achievement in the Field of United States Numismatics. William Elliot Woodward was one of the first American coin dealers, entering the business on a part-time basis in 1860. Woodward issued auction catalogs from 1860 to 1890, eventually producing 111 in total. Scattered throughout his catalogs are interesting tidbits, including scholarly material, collector biographies, scathing criticisms of his competitors, and comments about other individuals that would probably lead to slander suits today. Woodward accused the U.S. Mint of questionable practices, when made-to-order rarities began appearing on the market or when certain individuals appeared to have an "in" with Mint officials. Highlights of his auction career include the sales of the collections of the Rev. J.M. Finotti, John F. McCoy, J.N.T. Levick and William Jenks (among others). Woodward is perhaps best remembered for his 1867 sale of the celebrated collection of Joseph J. Mickley. Woodward was a true numismatist, well-versed in many areas, thus adding to the breadth and depth of the offerings he brought to market. PCGS CoinFacts (www.PCGSCoinFacts.com) is the Internet’s most comprehensive, one-stop source for historical U.S. numismatic information. Professional Coin Grading Service has graded over 20 million coins with a total value of over $20 billion. Both PCGS and PCGS CoinFacts are divisions of Collectors Universe, Inc.
For additional information, call (800) 447-8848 or visit online at www.PCGS.com.